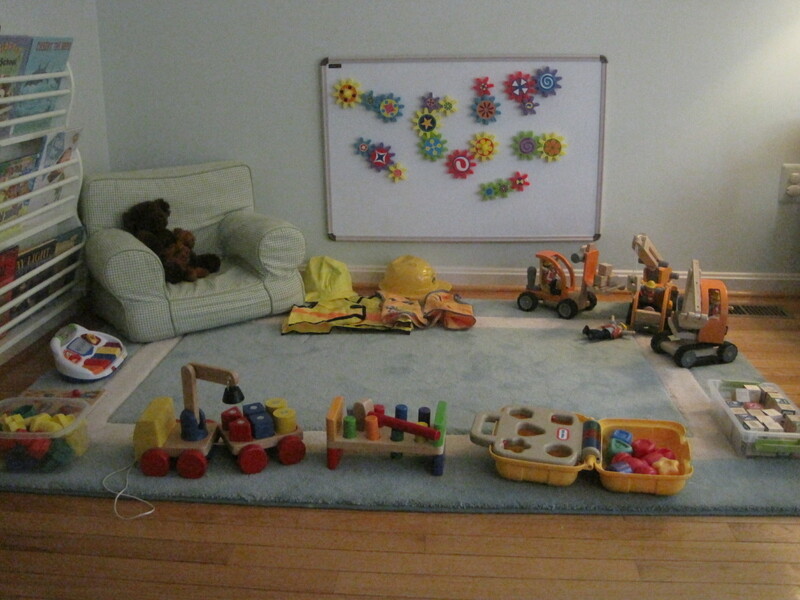 A step-by-step guide explaining why and how to establish a toy rotation system in your home. Written for every parent who has ever wondered what to do with their kid’s toys or why their kids seem bored at home. WHY TAKE THE TIME AND ENERGY TO ROTATE TOYS? The simple answer is that young children learn best from new experiences. They learn as they discover a new way to play with an old toy or as they engage with a new toy. Children’s brains are programmed to absorb everything they hear, see, taste, touch, etc… However, if they keep touching the same textures and seeing the same toys, in the same place and container, they loose interest and stop attempting to interact with their toys because they are too predictable. WHILE A LITTLE BOREDOM CAN PROMOTE CREATIVE AND SELF-DIRECTED PLAY, TOO MUCH BOREDOM IN YOUNG CHILDREN CAN CAUSE UNNECESSARY NEGATIVE BEHAVIOR. AND NEGATIVE BEHAVIOR CAN LEAD PARENTS TO MISTAKENLY OVER-SCHEDULE THE FAMILY CALENDAR TO HELP AVOID MELTDOWNS. Early childhood educators around the world implement toy rotation systems in their classrooms. Why not implement a similar system at home? It is inexpensive and can count as an “educational activity” in place of an expensive class. Toy rotation systems promote higher-level thinking during play and result in children playing for increased increments of time. You may spend 30 minutes rotating toys, but you will find your child playing independently for up to an hour afterwards and more frequently throughout the week. Young children will not become spoiled from being offered different toys each week. Providing a variety of toys that speak to a child’s developmental needs and having her help clean up, care for, and arrange her toys each week is very different than continuously buying toys for a collection (ex. Thomas the Tank Engine trains or American Girl dolls). Toy collections seek to entertain and can lead to spoiling, while toy variety stimulates and is enriching. THE VALUE OF ROTATING TOYS DURING EARLY CHILDHOOD IS PRONOUNCED BECAUSE OF THE UNIQUE STAGE OF THE CHILD’S DEVELOPMENT. Young children have a different learning style than adults and older children, as well as a host of limitations due to their lack of introspection, short attention spans, limited physical abilities and need for familiarity, yet fascination with the unknown. For more information on why rotating toys is important and why the idea of a playroom is a bit old fashioned, read my article called “Rethinking the Playroom”. *You may have one, or several areas, that would benefit from toy rotation. For the purpose of simplicity, this article will teach to rotating in one primary play area. You can extrapolate the principles to rotate toys throughout several play areas if you choose. Begin by assessing where your child plays the most. If you are choosing one primary play-area, select one that is central to the most frequented rooms in the home and that offers plenty of floor space for toy display. I like using rugs to designate play-spaces. For those of you rotating in several areas, choose locations in each of the most frequented rooms in your home. Tables, corners, nooks and rugs make great locations. 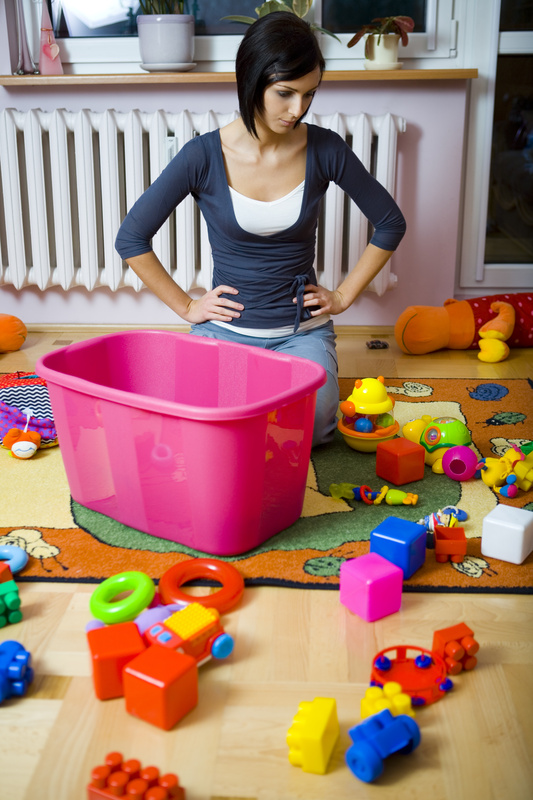 Find every toy in your home that is a good candidate for toy rotation and toss it into a pile. However, consider leaving your pretend-play food in the kids kitchen or the elaborate puzzles in their boxes in the closet. A good rule of thumb is that if you don’t mind seeing the toy scattered out on the floor, put it in the toy pile. 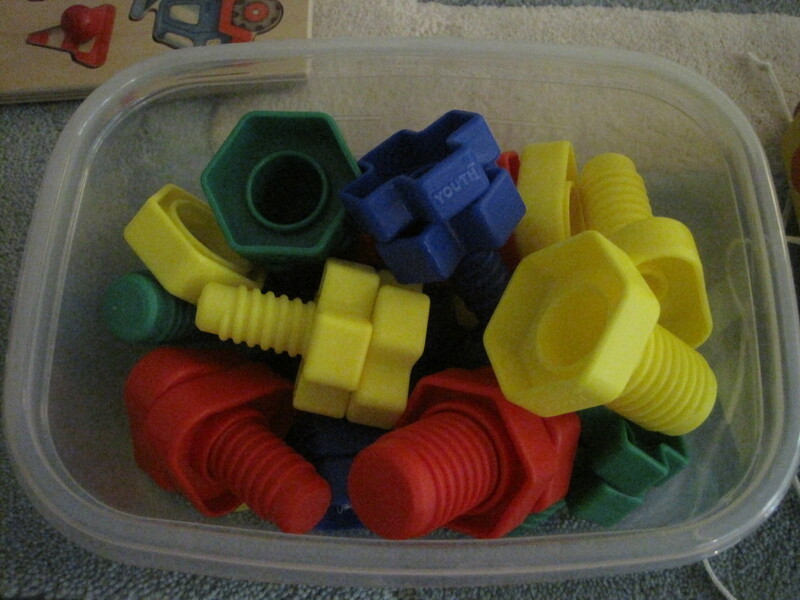 If you want to rotate toys with several small pieces, then use clear containers with lids (that children can remove) or plastic-slider baggies to keep the toy together as unit while in storage or on display. Toss or donate toys that are missing many of their pieces as well as toys that are too bulky and drive you crazy. Also, if a toys just doesn’t offer opportunities for higher level thinking during play, then there is not need to keep it. *If you are not sure how to tell if a toy offers the potential for critical thinking, see my article “How to Buy Toys that Kids Actually Use”. Sort your toy pile into several smaller piles according to the toy’s primary educational functions listed below. It sounds worse than it is! A primary educational function of a toy is simply what the toy is used for most of the time. 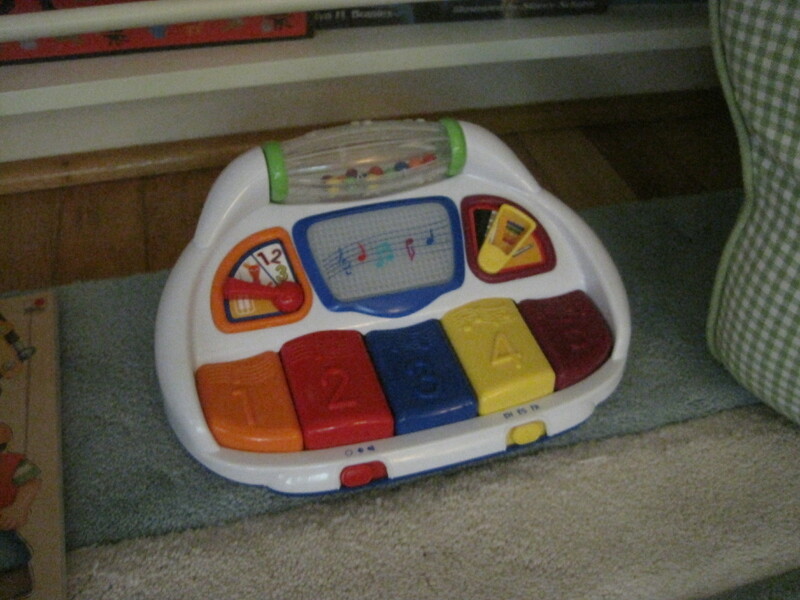 Here are some realistic examples from the toys in my home. Some toys have multiple functions and service many categories (don’t over think it, just choose a category). I also keep a bin of random toys and parts that can be fun for creative, constructive play. Feel free to make a pile of random toys too. Girls like to play cars & trucks too! Boys like to play “baby” too! 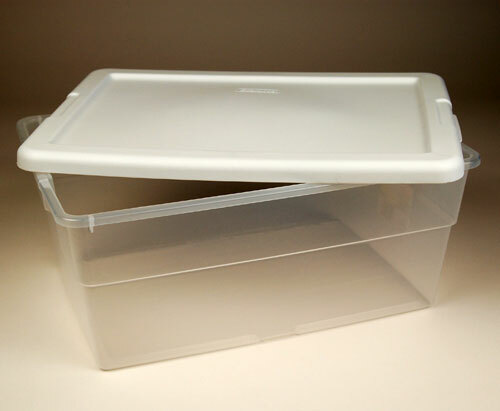 A) Buy 4 to 5 large bins for toy storage (see photo above). 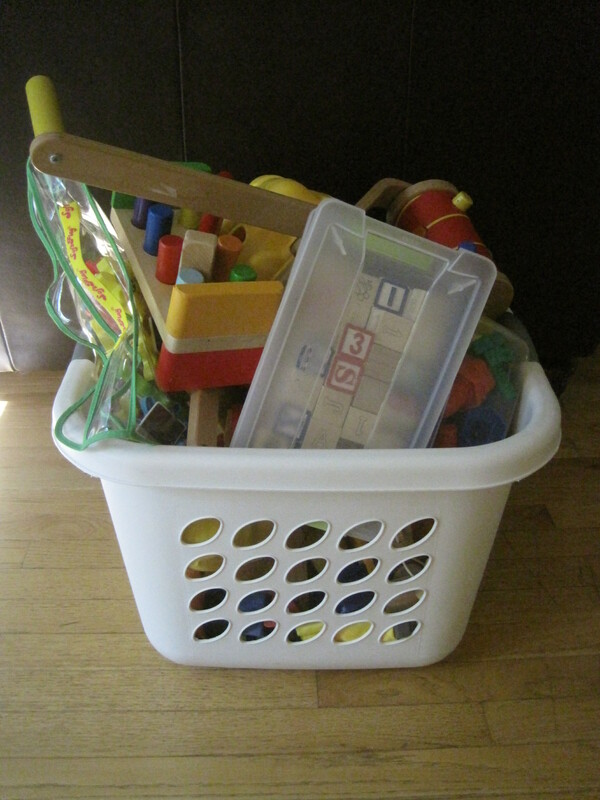 Plan to display the contents of one bin per week so that you have one month’s supply of bins/toys. The remainder of the toy bins will need to be stored while not in use. B) Separate your toys into the bins, adding at least one toy from each category. Aim to put 7 to 12 toys in each bin. Double up on the categories that have extras and don’t worry if you don’t have a toy from every category for each bin (make a mental gift list and let it go). If bulky toys will not fit in the bins, make a separate storage area for your bulky toys and rotate these along with the bins. C) Some parents like to number the bins to create an order of rotation or keep a list of bulky items to avoid skipping toys or bins. D) On toy rotation day, simply select the new toy bin, dump and display its contents and put the old toys away in the bin. My category of choice, so you are not alone. A) If you would like to have more control from week to week as to which toys are chosen, then find a spacious place to store most of your toys. If you need to spread out your toy collection into multiple locations, then keep all the toys from one category in one closet. For example, all the imaginative play toys are in your son’s closet and all the gross-motor toys are in the playroom closet, etc… This makes it easy to select one toy from each category, every week. B) Go to each of your toy storage locations and pick one toy per category. Throw it into a basket (as seen above). C) Display the toys in your basket in your playareas and put the old toys in your basket to be returned to the storage closets. D) It can be helpful to post a list of themes on the closet wall or storage containers as it can be hard to remember which toys have been used recently. 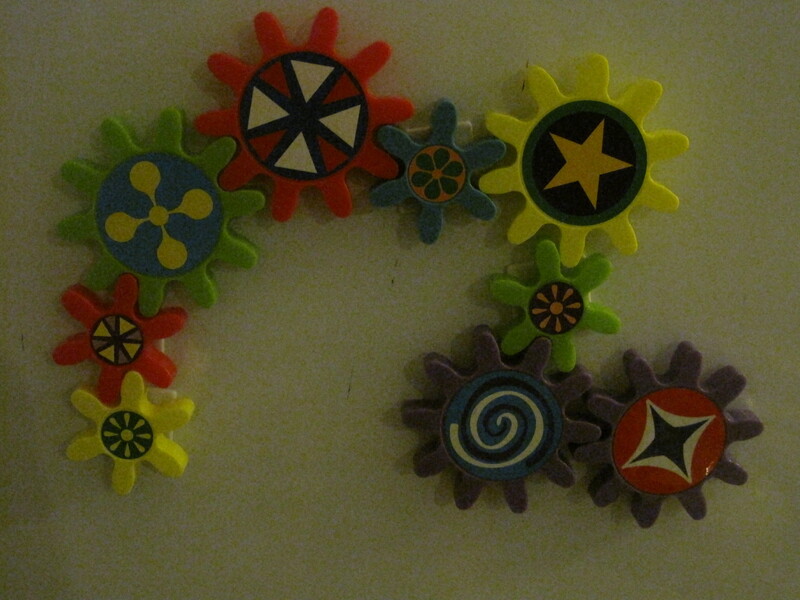 I recommend that clients rotate toys using themes based upon your imaginative play toys (ex. farm, kitchen, doll, construction, etc…). This way, you can still have control over which toys are displayed, while ensuring that most toys make it to the floor every month or two. It can be fun to try and find toys from each category that match your theme. For an example, see my toys pictured in the primary educational functions list above as they are examples from my construction-themed week. *An example of one of my primary play areas. For more info, reference my article on toy display. Aim to display 7-12 toys at a time. Lump all the imaginative play pieces together. Instead of putting all the toys in a clump in the corner, line them up against a wall and keep toys from stacking on top of each other. 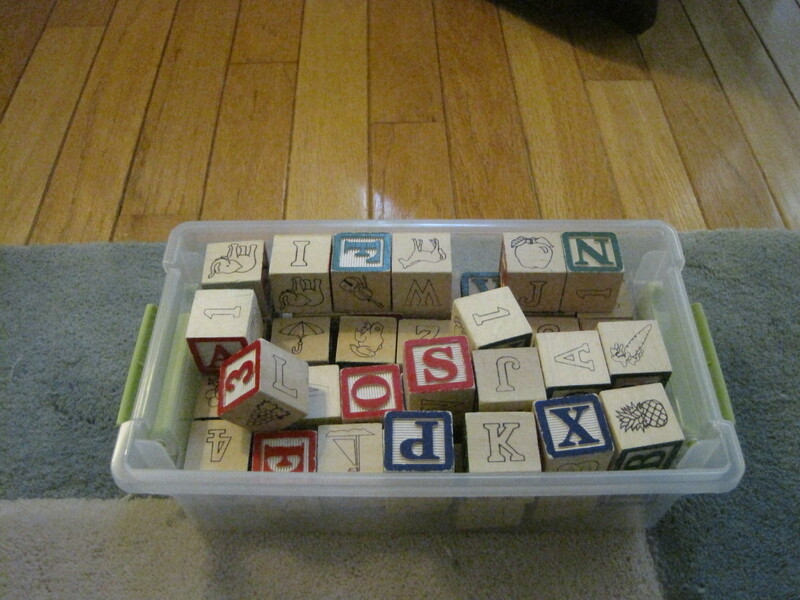 Open up smaller bins storing blocks, etc… Toy boxes are not developmentally appropriate and should be used for long term storage only. Remember, for a small child, out of sight is out of mind. Pretend that you are setting up a shop. How would you display your products so that customers will want to pick them up and buy them? HOW TO MAINTAIN A TOY ROTATION SYSTEM? Give the system time. Don’t give up too soon on your own ability to rotate the toys and your child’s ability to play with the toys. 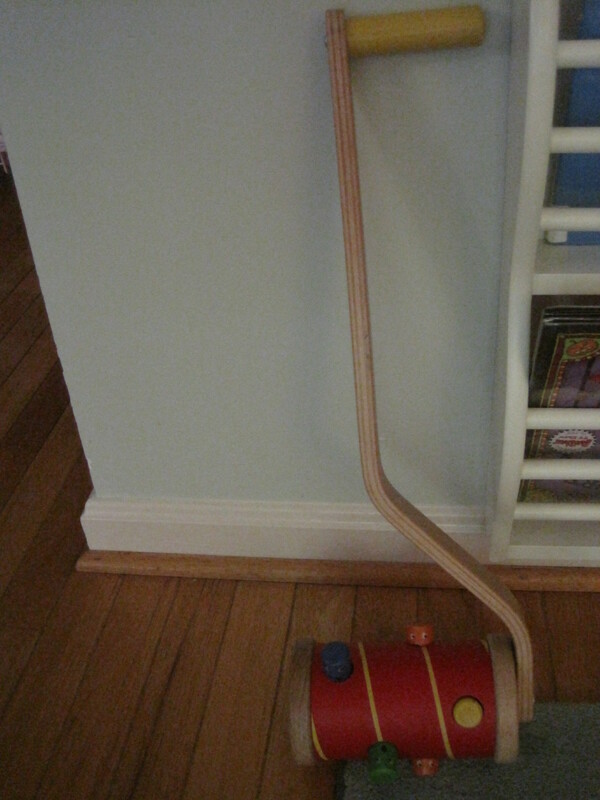 Children often need a couple months, just as you do, to adjust to the new way to play at home. I can’t count how many times clients have told me “less really is more when it comes to toys” after trying out a toy rotation system. TRY IT FOR 3 MONTHS BEFORE QUITTING. IF YOU PERSIST, I CAN GUARANTEE THAT YOU AND YOUR CHILDREN WILL ENJOY THE PAY OFF ONCE EVERYONE HAS TIME TO ADJUST. *For tips and tricks on maintaining your toy rotation system, check out my article on avoiding toy rotation burn-out. 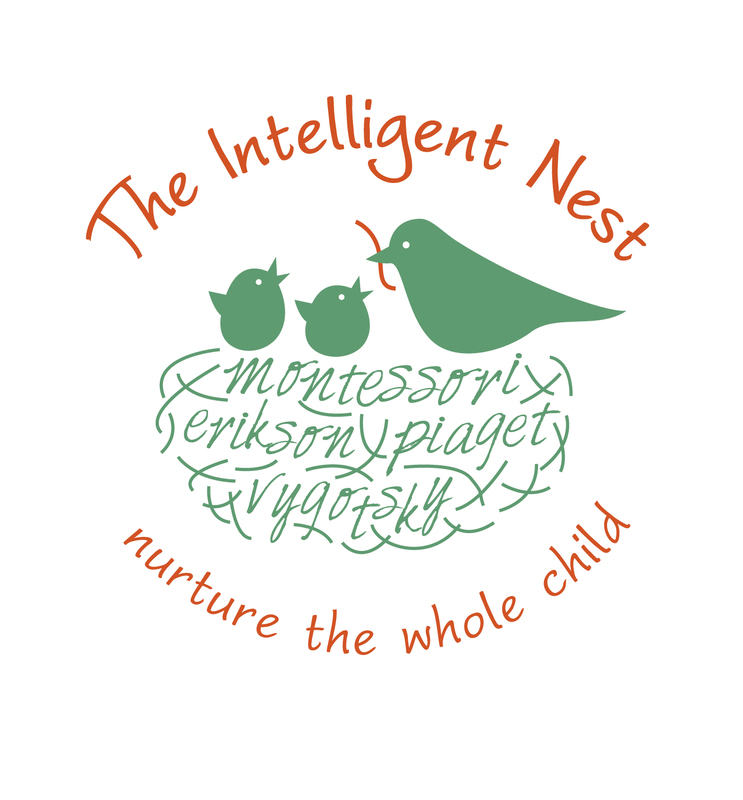 And remember, an Intelligent Nest is a balanced nest. Ease into it and be flexible. Make your system unique to your family’s needs and most importantly, have fun! I definitely need to do this, it will help me get organized! Thanks for the great tips! This is so informative. Thank you! We will definitely have to try this! We’ve wanted to in the past, but have VERY little storage in our house to store his toys. Maybe we’ll just have to store them in his closet, which he rarely uses anyway! I attended Kristen’s seminar on toy rotation and play. We have been doing toy rotation for about 3 months now and it’s working out great. Sometimes we change toys every 2 weeks, sometimes 3 since my kids are in daycare and only get limited play time during the week. It has helped on that “we have too many toys” feeling and I think my 2 year old is playing more with things now that she is not so overwhelmed with a huge pile of toys to choose from. I use big IKEA bags for the toy storage bins since they are forgiving when you are cramming some odd shaped toys together with other toys. I use the smaller shopping bag size IKEA bags for the books. I have 4 bags of toys and 4 bags of books that we rotate between our 2 main play areas (upstairs and downstairs). Great article. I’ve not had much luck with toy rotations in the past – probably because I didn’t display the toys, just left them in the box – will give it another go now though. Any tips on toy rotation when you have more than one child? I have a 19m and a 4 year old. Wow, this is so incredibly helpful. Thank you! 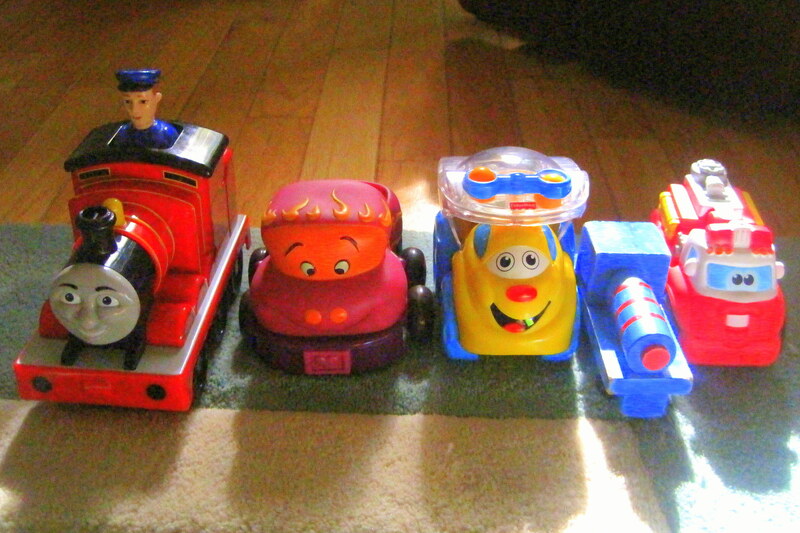 I instituted toy rotation this weekend for my 1 year old and could not be happier. He was suddenly interested in toys he hadn’t noticed in weeks. This morning while I was making lunch and cleaning up from breakfast instead of mumumumumum-ing me and pulling on my leg, he was off in the living room playing with the dozen or so toys displayed in our cubby-hole coffee table. It took less than an hour to sort all this toys – I printed this post and made a list of his toys in each category, put a few toys from each category into each of three piles and neatly stacked two of the piles into large toy totes. Thank you so much for making this easy for me! p.s. I added at 13th category for “balls” since we have so many and they’re some of his favorite toys. Great idea!! So glad it was a success– keep it up! Yes! Please send and update! I would love to do this in our play spaces. What if we have two play areas (upstairs & downstairs)? Should I do 8 rotations, 4 for each area?? It depends mostly upon how many toys you have and how much storage and time you have to devote. If you have play areas that get a lot of use without rotation then you don’t have to devote as much time to those, leaving time leftover to focus on other spaces. If all of your playspaces are undefined (meaning no set theme for play) then you can rotate all your toys throughout all the playspaces. If you have theme (kitchen, art, workbench, etc…) then you can rotate the bulk of your toys through the undefined centers and leave the toys that go with the themed play spaces. Perhaps in the themed spaces you can divide the toys in half and display half and store the other half nearby, rotating in and out as time allows. Please let me know if that answers your question. Good luck! i never leave replies but i just have to share that we have been rotating toys using your categories for 5 weeks now. Fewer toys at once has made my 3 kids play more, play better together, play with toys they never played with before, clean up each night has been a breeze and we are all much happier and less stressed. it took some effort to organize toys so i had one or two from each category but this week we are starting our toy rotation back to week one and i could finally just grab those toys and set them out. i’d tried a few other methods but yours worked the best! thanks a million! This is a great organizational idea. Hopefully, you find it to be a waste of time. If your children have so many toys that you have to plan when to play with what, there are to many toys. Get rid of half and let the kids chose. Instead of spending time organizing, sit smack down in the middle of the room with all the toys and play. Your children will talk for years about the time you played this or that. Children form memories from the smallest of pleasures. Memories are not formed around the things you plan for good memories. Almost guarantee they won’t be talking about how well you organized. 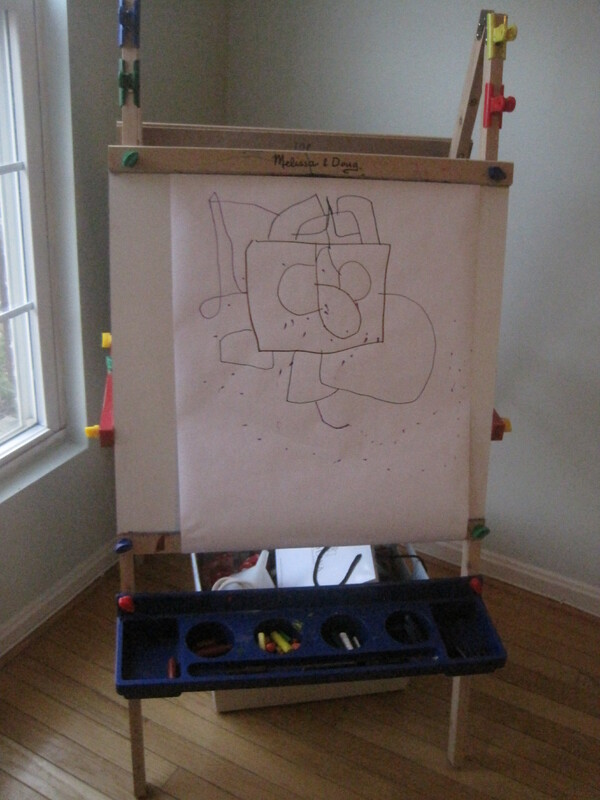 When the kids are grown and gone, you will have plenty of time to organize. Especially if they don’t call because they have no fond memories, the ones they made. Please don’t write nasty notes if this note does not pertain to you. I’m writing strictly as a reminder and maybe for a bit of insight for the youngest of mothers that haven’t this yet. Kids first. Organize… sometime. Hi! I completely agree with some of your points. Intelligent Nest is above all things a BALANCED nest and I would never, ever suggest that someone prioritize organization over their children. If you read through my blog, you will find that this is one of the primary issues that I raise with modern parenting and one that I hope to encourage parents to avoid at all costs. Readers– please do not mistake toy rotation as anything more than just a suggestion. Use it, don’t use– whatever works for your home. The goal is to help make happy, healthy kids and parents. Toy rotation works well in scholastic environments and gets a lot of applause in the research community, but this doesn’t mean it is right for your family. Many families do LOVE it and everyone works together and participates and that doesn’t mean that people who like to do toy rotation are ignoring their kids or are bad parents. 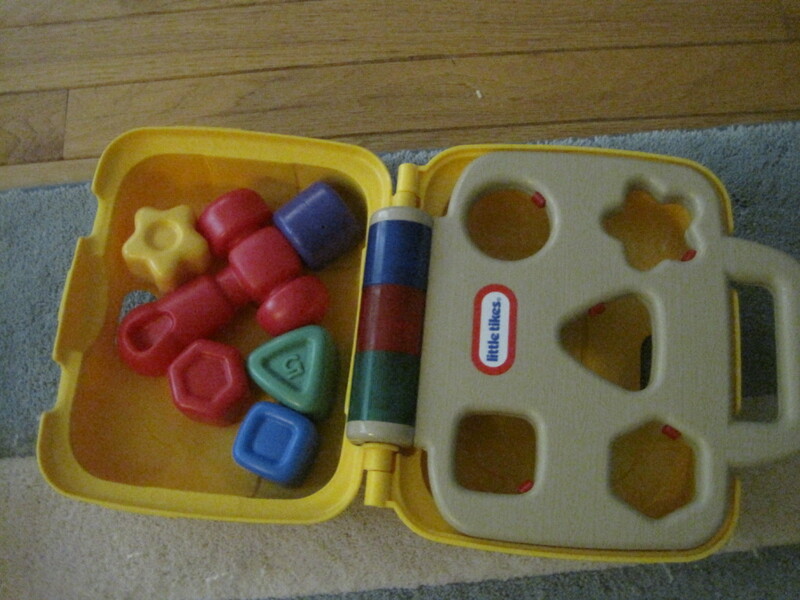 Just like people who choose not to use toy rotation are not negligent, bad parents. I love comments on Intelligent Nest, but I stress that we only criticize ideas (with reasoned evidence– never a take down approach) and never, ever people. I like to assume that every parent loves their children and we all approach parenting in different ways. If this assumption isn’t apart of future comments, please find another site to post. Oh my, where are those wood construction vehicles from? Aren’t they adorable? They are made by PLAN Toys, purchased from Amazon. I’m not seeing the same set though online currently. Perhaps try Ebay? Happy hunting! Can you elaborate on the differences between imaginative play and dramatic play? Would a Peppa Pig campervan be imaginative play, vehicles, or socio-emotional? I would love to do this but so many toys fit into multiple categories. Great question! 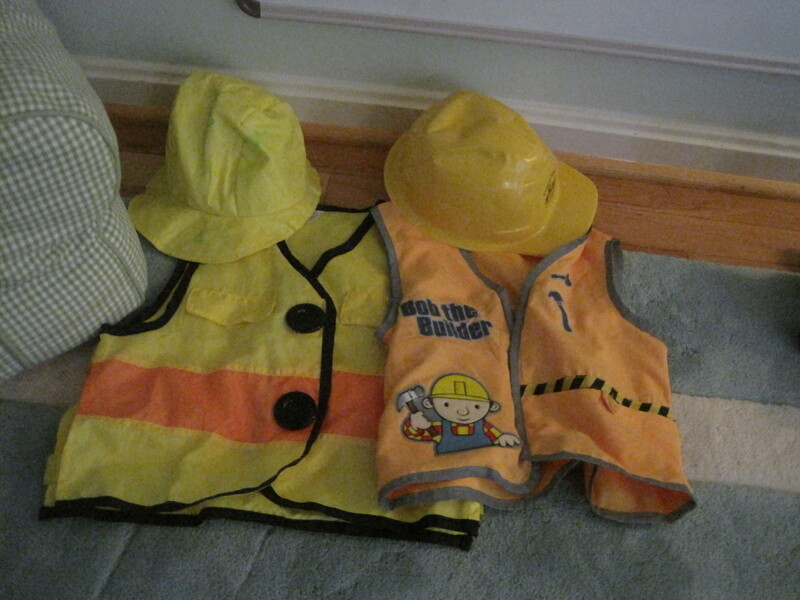 Dramatic play involves negotiating social relationships (roles, responsibility, culture, etc…). Imaginative play is all about detaching from reality and just letting your mind take you where you want to go– to the moon, zoo, a classroom or grandma’s house. So, Pegga Pig campervan could be both. 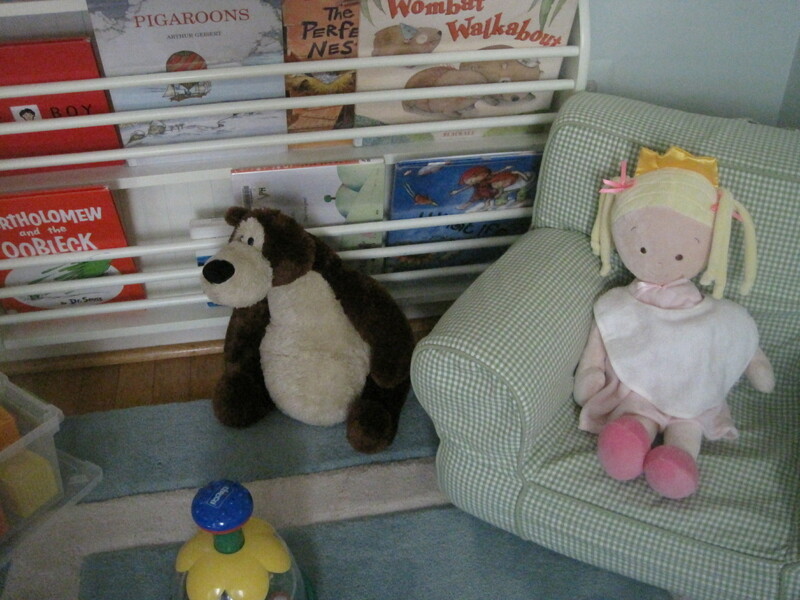 Imaginative v. dramatic play has more to do with how the child will use the toys. Sounds like a 2-for-1 toy!! Don’t get too caught up into having to have the categories fit perfectly– there will always be overlap. Just make a quick call based upon how your child might use the toy most or let a great toy stand in for multiple categories. The categories are just a guide to help you create a system that makes your life easier. Thanks for your question and for reading! So how do you deal with 20 dinosaurs? Lol. My 2 year old daughter loves to line them all up on the window ledge or table. She moves them all around. They live in a cloth shopping bag. Do you put dinosaurs in each week’s toy box so she always has a few? Same thing with her mickey mouse people or her 12 little yellow ducks. I want to buy some of the IKEA cube storage shelves and use the cloth bags. Would that work for this rotation system? Great question! If the dinos are being played with regularly, I’d leave them out until you see that they are being tossed aside, either as a whole set that you have a separate IKEA container for or by putting several in each week’s bin. Either way, it sounds like you found a toy that works well so I’d keep it in rotation until it doesn’t. Thanks for reading! Thanks for the feedback. Yes I keep running into this collection issue. For instance she has the Little People A-Z animals. So would you put all 26 animals together in one week’s box or split them up and do like 6 animals per box assuming you are doing a 4 box rotation? Lol. Same thing with a collection of little books. She has one that is a 12 pack of the tiny books. Do you break those up and put a few in each week’s box? So many things are collections of multiple pieces. Now I’m also wondering if you would do this with a DVD collection. Would you keep them all out and allow them to select any or put 4 in a box for the week and hide the rest. So many ways to go about this I guess. It has my mind going in many directions but hopefully it will help with all the toy clutter and her aimlessly wandering through the house and dumping everything everywhere! It might be tricky to rotate everything, but eliminating visual clutter and offering fewer toys at a time helps improve play so if it can be done, then it is worth a try! This is really one of the best toy rotation articles I have read. You have a lot of good insight and the ” Pretend that you are setting up a shop. How would you display your products so that customers will want to pick them up and buy them?” That is a really good tip I even forget about stuff that’s in our toy box. I’m going to clear out our toy box and use it for stuffed animals only. do you sort out books into your toy rotation? What brand/ where did you get those construction vehicles in the picture? They look sturdy , we have a bunch of those “cheaply made but overpriced with tons of little parts that constantly fall off and break” vehicles. Id like to invested in some better quality ones. Thank you for your kind comments and questions! I rotated books and also left books permanent in a bookcase. 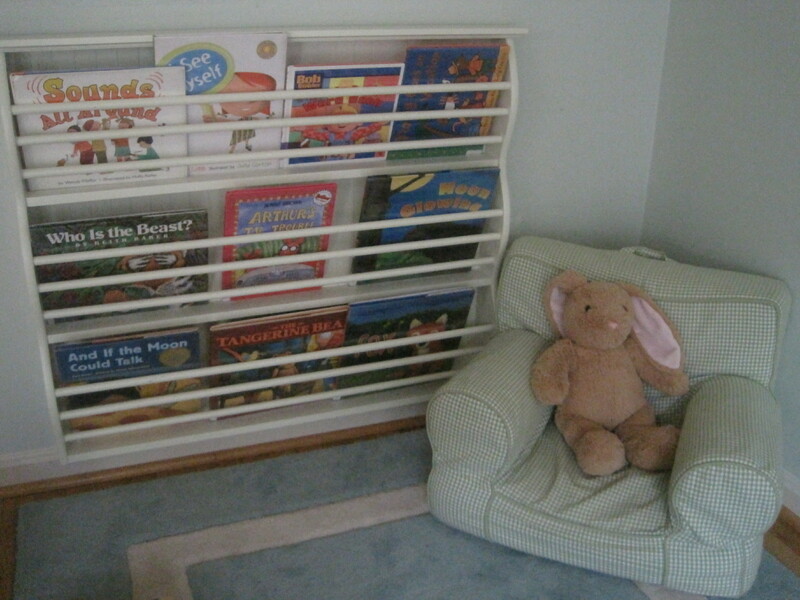 I used a book sling to display books and book cases and baskets for storage. There is an article on book display on the website. 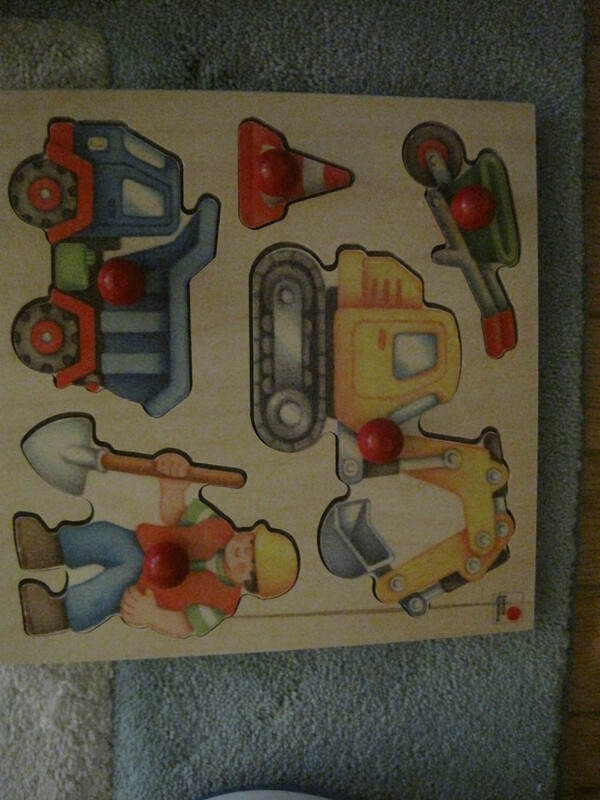 The construction trucks are PLAN Toys. They were awesome!! Thanks for reading!